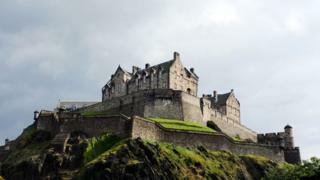 Six Scottish attractions have reported visitor numbers in excess of one million last year. The most popular - the National Museum of Scotland and Edinburgh Castle - each saw more than two million visits. The other sites reporting at least one million visitors were the Scottish National Gallery, St Giles' Cathedral, Glasgow's Riverside Museum and Kelvingrove Art Gallery and Museum. The Association of Scottish Visitor Attractions compiled the figures. The total for all 232 attractions covered in its 2018 Visitor Trends Report was more than 30 million visitors. This represented a marginal (0.1%) increase on the previous year. The Association's chief executive Gordon Morrison said: "Although reporting only a modest increase in visitor figures of 0.1%, it should be remembered that 2017 was something of a stellar year. "To be reporting even a modest increase in 2018 visitor figures is therefore a great achievement for the industry. "Investment in new attractions, plus attractions that have invested in their visitor offer by developing innovative new products and services and launching inspiring events and exhibitions programmes, are not only reaching new visitor markets but are actively encouraging their existing visitors to return time and again." Attractions across Dundee and Angus also recorded an increase in visitors, largely down to the V&A's arrival in September. Malcolm Roughead, VisitScotland's chief executive, highlighted the role played by film and television in promoting Scottish destinations. "The arrival of V&A Dundee, as well as the increasing interest in set-jetting, thanks to TV series like Outlander or films such as Outlaw King, have only strengthened Scotland's appeal," he said. "With the opening of Moat Brae in Dumfries and the redevelopment of Aberdeen Art Gallery taking place this year, there is plenty to look forward to in 2019."